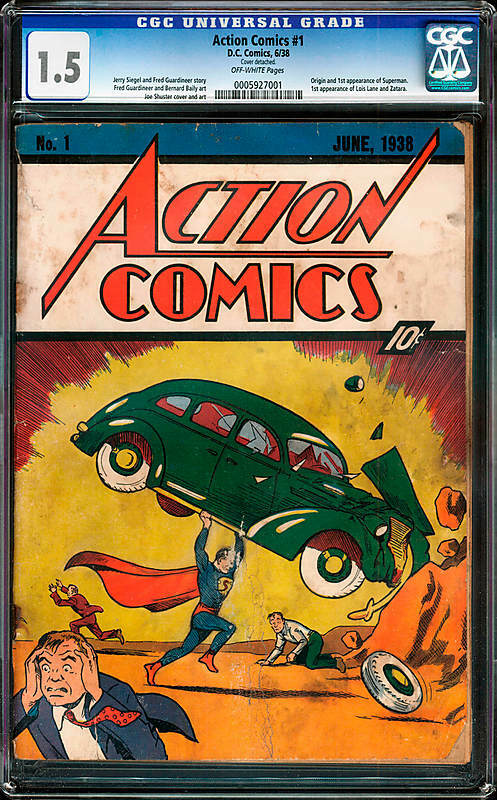 A copy of Action Comics #1, found inside of a wall during the remodel of a recently-purchased home in Minnesota, is already fetching $113,000 at auction site ComicConnect. "[The homeowner] has spent years tearing down old walls and putting up new ones for his home-renovation clients. He's made a habit of leaving a quarter or dollar bill behind them, thinking that sometime in the future, someone will find his treasure and wonder who put it there. But the 'hidden treasure' in the walls of the first home he'd ever purchased and renovated on his own yielded the most unusual find he could have imagined. When renovation began on the house, which was built in 1938, he and his crew started finding old newspapers from the 1930s used as insulation in the walls. But he also found a comic book, which stood out to him, because it had Superman on the cover. Curious, Gonzales looked up the comic book online-and discovered it was Action Comics 1-Superman's first appearance." CGC graded at just 1.5, the book could have brought in even more if not for some clumsy handling that resulted in a tear that has left the cover partially detached. While showing the book to relatives the homeowner, named David Gonzalez, says they were a little too grabby. "They got all excited and tried to take it," Gonzalez, told the Star Tribune. "I understand it’s something cool, but told them: ‘You don’t have to act so rude. I brought you in to show you, don’t grab it.'" ComicConnect estimates the damage done by that tear at $75,000.